It’s reflection season in Yosemite, that time of year when the falls are dry and the Merced River slows to a glassy crawl. Plugging in the golds and reds of autumn makes this my favorite time for creative photography in Yosemite, and explains the volume of Yosemite autumn images in my portfolio. It also explains why I’ve been to Yosemite three times this month. The month’s first visit, with my Eastern Sierra workshop group, we photographed high Sierra reflections and a Half Dome sunset from Olmsted Point—we’d had lots yellow and orange aspen in the canyons above Bishop and Lee Vining, but it was a little early for Yosemite color. 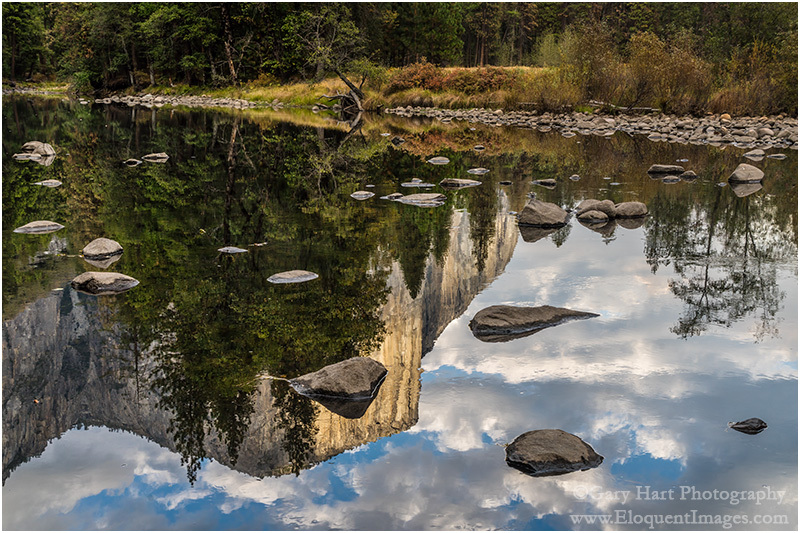 The next two trips were primarily focused on Yosemite Valley, ground-zero for autumn reflections. On both Yosemite Valley trips, the Merced River, always low and slow in autumn, was down far enough that I saw places I could have rock-hopped from one side to the other without getting wet. Today’s image, from about a week and a half ago, almost didn’t happen. I’d been looking forward to this visit (to guide a couple from Sweden) for several months, but a bike accident two days earlier had cracked a rib, torn a muscle in my shoulder, removed copious amounts of skin from my arm, and pretty much prevented me from doing anything requiring movement (or breathing, for that matter). When I left home that morning I knew I was going to be sore, but I was actually a little surprised by just how uncomfortable I was. Somehow, bolstered by liberal quantities of ibuprofen, I managed to survive the day, quite content to limit my activity to driving, narrating, and and answering questions. Even getting in and out of the car was an ordeal, and photography seemed out of the question. But when we pulled into the parking lot at Valley View for the day’s final stop, the reflection drew me to the rocks like the Sirens of Greek mythology. Rather than grab my camera bag and sling it over my shoulder as I normally would (the mere thought makes me flinch), I gingerly extracted my tripod, camera, and 16-35 lens, and assembled them them at my car’s tailgate. Given my level of pain and the precarious footing on the rocks by the river, I knew wouldn’t be able to move around as much as I’m accustomed to (or at all), so scanned the route and I very carefully selected my destination before departing on the 20 foot journey. In a perfect world I’d have been able to shuffle slowly, but the route to the river was over a disorganized jumble of granite rocks that made each step feel like a knife had been thrust into my ribcage. At the river I found a flat granite platform just large enough for both my feet, and a solid rock for each tripod leg. Using the tripod for support, I found that if I moved slowly enough, I could keep the pain to a manageable minimum. Nevertheless, I was even more deliberate than I usually am, strategizing and executing each movement. Soon I developed a workflow that allowed me to do pretty much all I needed to do by only moving my arms from the elbow down. There were a lot of moving parts to consider as I crafted this image. Since the focus point of a reflection is the focus point of the reflective subject, not the reflective surface, I needed DOF that went from the nearby rocks, just a few feet away, all the way out to El Capitan at infinity. But I couldn’t make DOF decisions until I composed and decided on a focal length. And as I tried to compose, I found that even the slight adjustment in focal length and framing introduced new problems—rocks cut off or jutting in from the side, or even worse, introducing bright sky at the top of the frame. At one point I thought I finally had it, only to realize that the top rock of the foreground triangle intersected El Capitan. Moving my tripod a few inches to the left solved that problem, but also made it impossible to use my viewfinder without repositioning myself. Rather than destabilize my precarious perch, I decided to forego the viewfinder in favor of the LCD (thank you Sony for the articulating viewfinder). With a little work I finally found a composition that achieved my framing objectives: balanced foreground, clean borders, and no sky. Now for my exposure variables. I estimated that foreground rocks were about 10 feet away—according to my hyperfocal app, at 40mm and f11, the hyperfocal distance was a little less than 16 feet. I picked a rock about that distance and carefully focused there, thus ensuring acceptable sharpness from about 8 feet to infinity. I decided to go with ISO 400 to mitigate the light breeze that moved the leaves just a little. The shadows were quite dark, while the cloud reflections contained some hot spots, but I was confident that my Sony a7R II could handle the dynamic range if I was careful. Watching my histogram, I increased my shutter speed until the highlights were right up to the point of clipping. Finally ready, I realized that my remote cable was in the car. Since there was no way I was going to put myself through an extra roundtrip, I engaged my camera’s 2-second timer and clicked. After reviewing the image on my viewfinder I made a couple of small adjustments and clicked again. I repeated this click/review/click cycle a couple more times, until I was satisfied that I’d achieved my vision. Click an image for a closer look, and a slide show. Refresh the screen to reorder the display. What a bunch of stunners, Gary! The pain was worth it but get well soon.